1. It reminds me of my sophomore year of high school. 2. The music sounds like Duran Duran covering Aerosmith. 3. The video. What’s up 80s color palette? 5. I like the idea that prom couples probably slow danced to this song without paying attention to the lyrics. 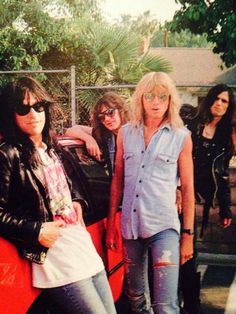 Kix did not hit the ‘overnight sensation’ jackpot. It definitely wasn’t all girls, glitz, and glamour from the get go. 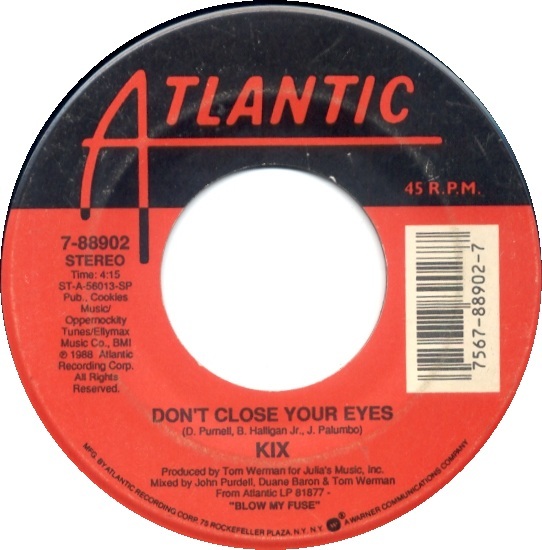 These Maryland rockers started out in the late 70s under a couple of different names, and it took a decade of hard work and non-stop touring, slowly climbing up the hard rock ladder, until they finally scored a hit (their only Top 40 single, in fact) with the anti-suicide power ballad, “Don’t Close Your Eyes,” in 1989. I believe I’ve stated in previous posts that the late 80s was not my favorite time period music-wise, but there are exceptions, and this song absolutely gets added to my “Best Of The Poofy-Haired Rockers Mega Metal Mix Volume 1” cassette. So bust out your denim jacket and ripped jeans, and hold on … hold on tight. I’ve never heard the term “hair farmers” but that made me laugh, too. 80s synth tones and I have brokered a peace deal. Some were okay at the time – most were not. But I’m more accepting of the less than great ones nowadays for some reason.